If you want to play one last Halloween trick on the kids, try this one on for size: Kristen Bell arrived on ABC's late-night show Jimmy Kimmel Live! last night for its Halloween holiday installment. Bell, channeling Magnum P.I., went from the dulcet melody of "Snowman" to a rip-roaring, head-banger rendition. And if you're wondering if Grohl can still drum while dressed as a 70-year-old man, the answer is an overwhelming yes. Before long, the song fully devolved into Metallica's "Enter Sandman". 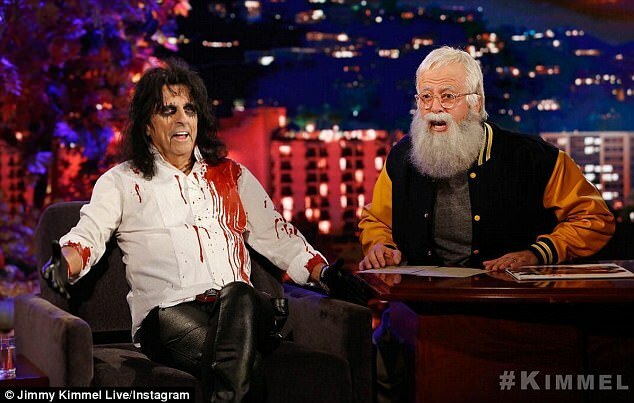 Yesterday being Halloween, Grohl dressed as Dave Letterman and that's not even the most outlandish bit from the shot. With Jimmy out this week, his pal Dave Grohl stepped in to host our big Halloween show. Introducing the Foo Fighters for that performance, Letterman said "my favorite band playing my favorite song". Grohl was unsurprisingly very comfortable in front of the camera, leading an interview with Alice Cooper where he pulled a few interesting stories out of the famed rocker including that time he allegedly killed a chicken on stage. That's what happened last night however when Frozen's Kristen Bell stopped by Jimmy Kimmel Live. The next such summit is to be held in Russian Federation next year, Rouhani has confirmed. Putin also held a separate meeting with Iran's Supreme Leader Ali Khamenei.